10 people (1 super-king master suite; 2 king master suites; 2 twin bedrooms which can convert to king) plus 4 extra trundle beds available at additional charge. 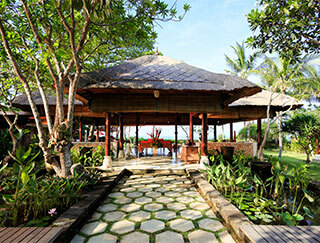 Open-sided living and dining pavilion; games room; outdoor dining; lumbung balé; massage balé. 18m x 5m. 1.2m-1.7m depth. Villa manager; chef; driver; 4 housekeepers; 3 gardeners; pool attendant; 5 guards providing 24-hour security. Masseuse and babysitter on request. The villa offers a selection menu featuring a wide variety of Western and Asian dishes. Requests accommodated (including special diets). Grocery cost is charged 20% handling fee which is subject to service and tax at the prevailing rate. Bose music system in living/dining and pool area; large flat-screen satellite TV with DVD and sound system in games room; snooker table; table tennis. 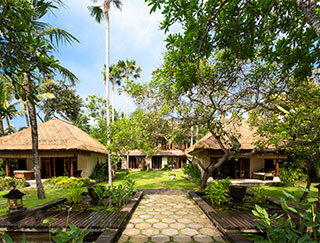 Villa Maridadi is a great family villa with plenty of kid-friendly facilities including trundle beds, baby cots, a high chair, pool toys, DVDs. Barbecue; tennis court (shared); 3 bicycles; back-up generator.